Is there a better alternative to MOAppsRecipes? Is MOAppsRecipes really the best app in Cooking category? Will MOAppsRecipes work good on macOS 10.13.4? 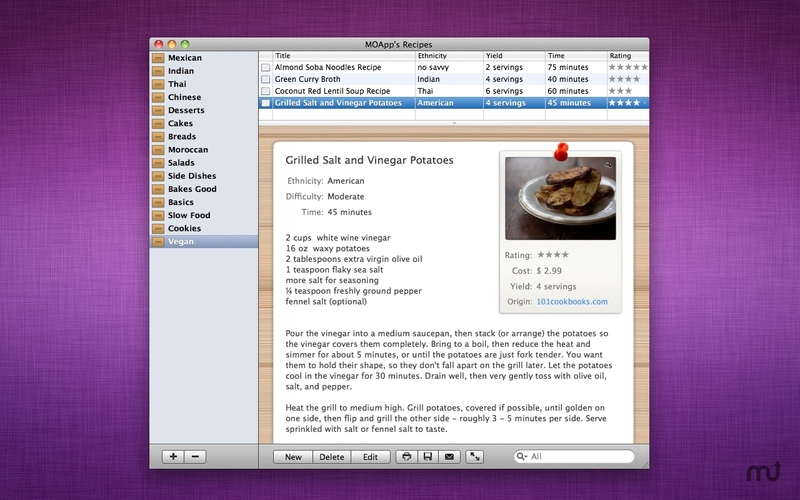 MOAppsRecipes is a cute and sophisticated recipe management application extra designed for ease of use. Organize all your favorite recipes and search for them and print them out with a single click. You can even mail them to your friend or daughter with a single click. And if you own a portable Mac, just use the gorgeous Cook View directly in your kitchen to focus on your cooking. MOAppsRecipes needs a rating. Be the first to rate this app and get the discussion started! After all, we don't dig through Grandma's old-fashioned cookbook first, but instead, we search on Google today. That's why in contrast to the other recipe management programs on the market today, you do not need to tediously store single ingredients one by one in Recipes. The only thing you need to do now is to copy the ingredients and directions directly from a website and you're done. Recipes are categorized, enabling you to find them all whenever you need them according to cooking time, quantities, ingredients and description.